What’s Causing This Inappropriate Laughter? Uncontrollable laughter or crying can sometimes be due to a disorder known as pseudobulbar affect (PBA). It is typically associated with neurological conditions such as stroke, multiple sclerosis (MS), Alzheimer’s disease, Parkinson’s disease, traumatic brain injury, brain tumors and amyotrophic lateral sclerosis (ALS), also known as Lou Gehrig’s disease. These conditions can affect the frontal lobe of the brain that keeps emotions under control. People with PBA may have dozens of episodes of uncontrollable laughter or crying during the day, which can be extremely distressing and embarrassing. 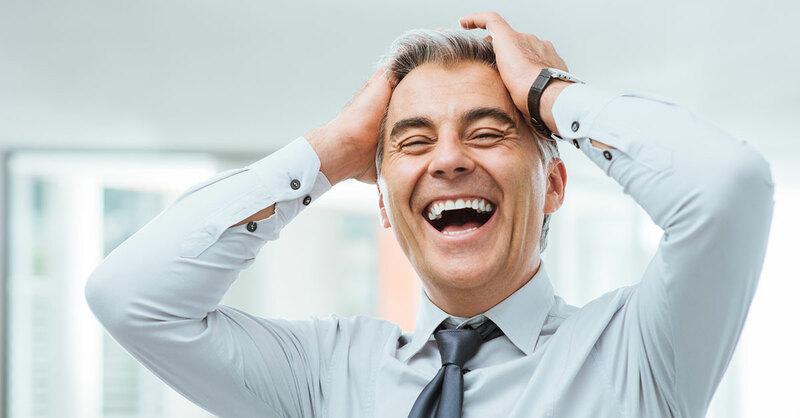 These sudden bouts of emotion are sometimes not connected to surrounding events or the person’s true feelings and can be completely inappropriate, such as laughing during a funeral. Emotions can also quickly switch, for example, from laughter to sobbing. A medication called Nuedexta (dextromethorphan and quinidine) has been FDA-approved for the treatment of PBA. Side effects can include changes in heart rhythm, so it may not be appropriate for people with certain types of heart disease. Uncontrollable emotional outbursts can also reflect an underlying psychiatric condition, such as bipolar disorder, especially if they are associated with symptoms of severe depression, mania or psychosis. Your husband should be evaluated by a neurologist to determine the cause of his emotional episodes. Editor’s note: Memory loss isn’t always the first sign of dementia. Certain forms of this devastating disorder can begin with unusual symptoms that are often mistaken for some other health problem.